This page is still in production, but we thought it worthwhile to publish the following documents and then revisit this page to offer some comment as resources allow. These documents are letters purportedly written by Dolores and/or Cecil Maxwell to solicitor Joseph M Bowe of Beauchamps Solicitors. No one who has visited this site for a time will be surprised at our adamant view that these letters were not written by Dolores or Cecil, but rather by Joseph Bowe's client Ethan Maxwell. You know, kind of like The Taxi Letter. More comment and other documents similar to these as time allows. We briefly note that prior to this letter above, Dolores had instructed Joseph Bowe that Kyle Maxwell and Emily Maxwell were to be her Notice Parties. The above letter was generated on foot of events in A Simple Plan and A Christmas Story. We note briefly that the addresses supplied by the author for both Sean and Saoirse were misspelled. The author was also unable to come up with the address for Dolores' oldest son Nathaniel. Of course Nathaniel had received a Christmas card from Dolores a short time prior to this letter. 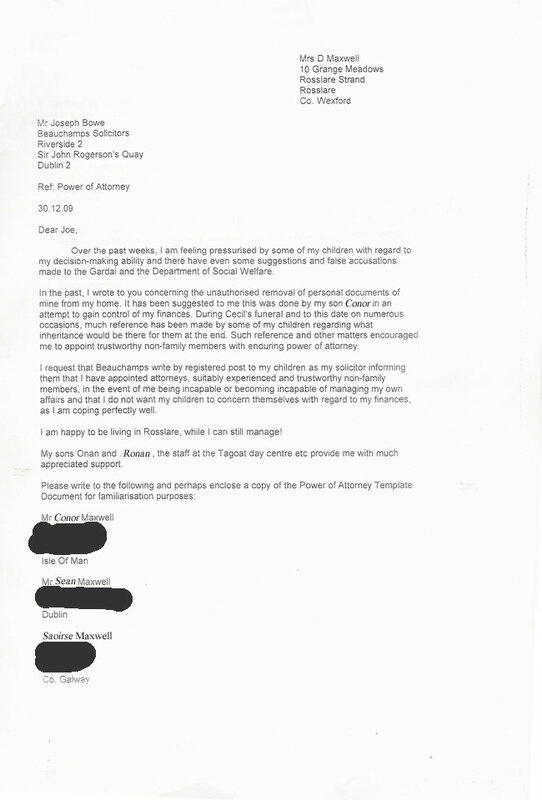 It is also curious that the letter says that two Attorneys were appointed in Dolores' EPA. Actually there was only one Attorney appointed. 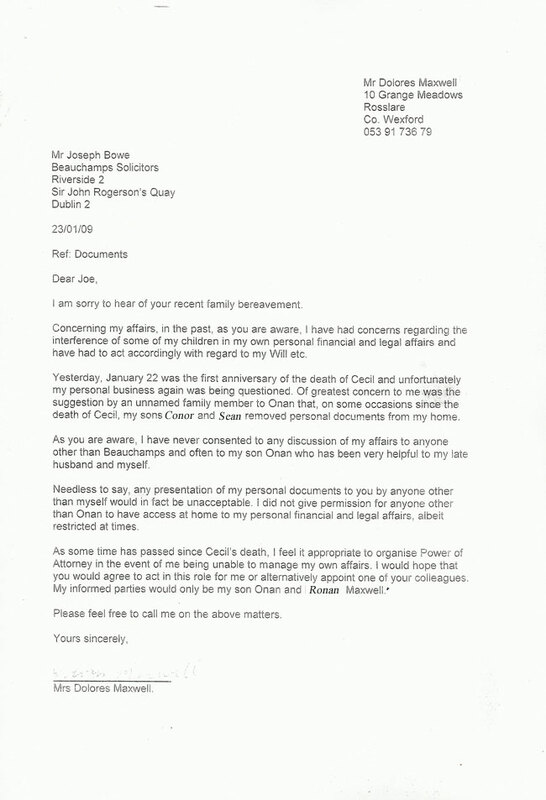 That would be the addressee of this letter, Ethan's solicitor Joseph M. Bowe. (Mr Bowe was Dolores' solicitor also.) 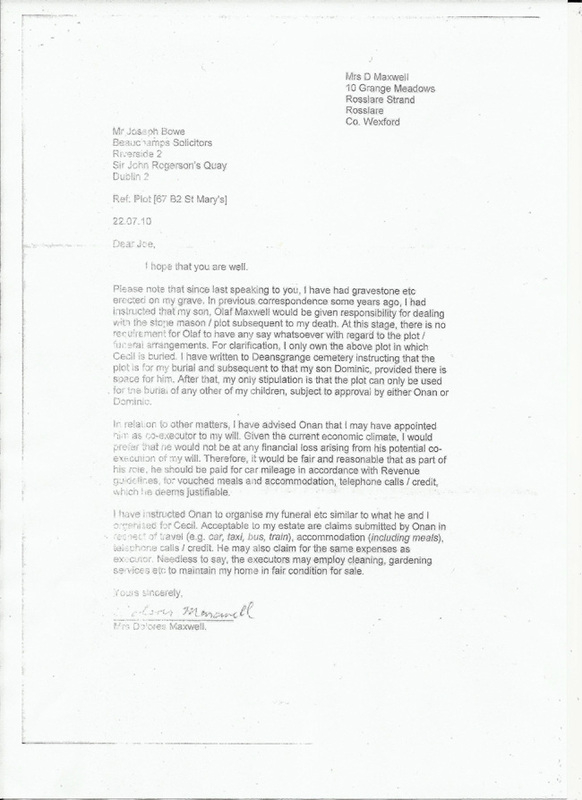 Funny that Mr Bowe would find nothing unusual in that the author of this letter seems unaware of basic facts about Dolores' EPA which he had prepared. We have blurred out the address hand written in Ethan's unmistakeable hand next to Nathaniel's name. 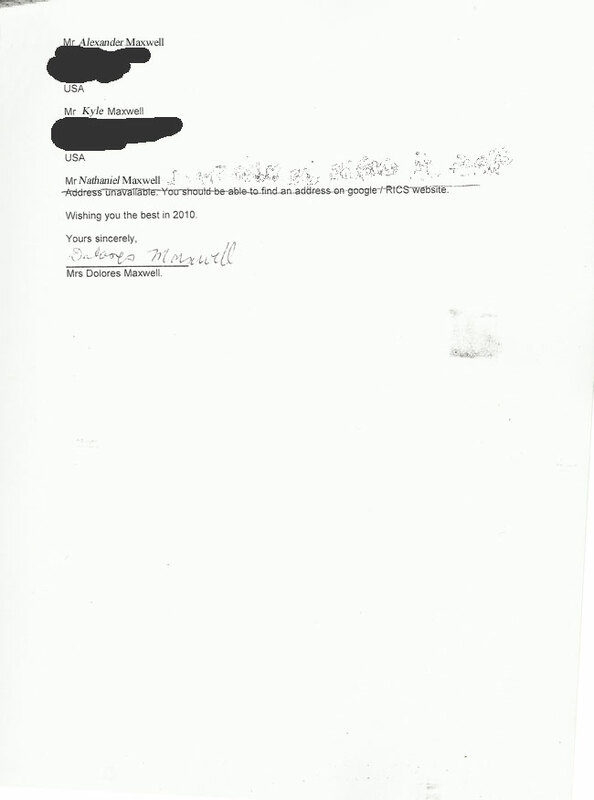 We note that the registered letter sent using that address was returned to Mr Bowe. As far as the author instructing Mr Bowe to Google Nathaniel to find his address, well, um, we wonder how anyone, especially Mr Bowe would consider that this letter was generated by Dolores, let alone accept instruction from it concerning her affairs. 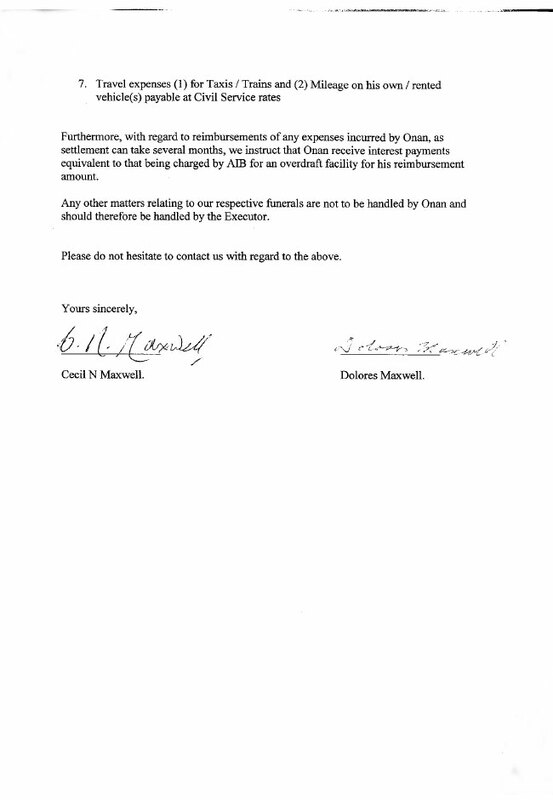 Mr Bowe did indeed, however, issuing the Solicitor's Letter a few days later. Dolores did not use a computer. Mr Bowe himself stated that Dolores didn't even use a typewriter. Please note that since last speaking to you, I have had gravestone etc erected on my grave. In previous correspondence some years ago, I had instructed that my son Nathaniel Maxwell would be given responsibility for dealing with the stone mason / plot subsequent to my death. At this stage, there is no requirement for Nathaniel to have any say whatsoever with regard to the plot / funeral arrangements. For clarification, I only own the above plot in which Cecil is buried. 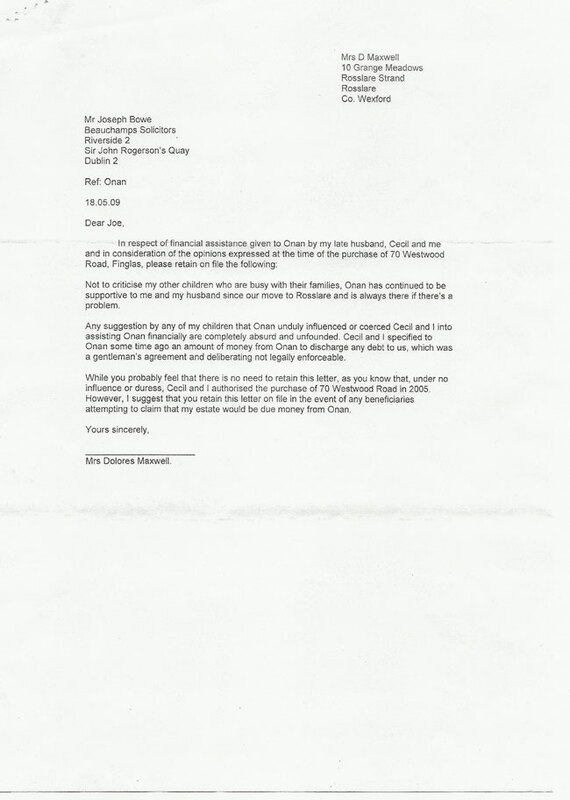 I have written to Deansgrange cemetery instructing that the plot is for my burial and subsequent to that my son Ronan, provided there is space for him. After that my only stipulation is that the plot can only be used for the burial of any other of my children, subject to approval by either Onan or Ronan. 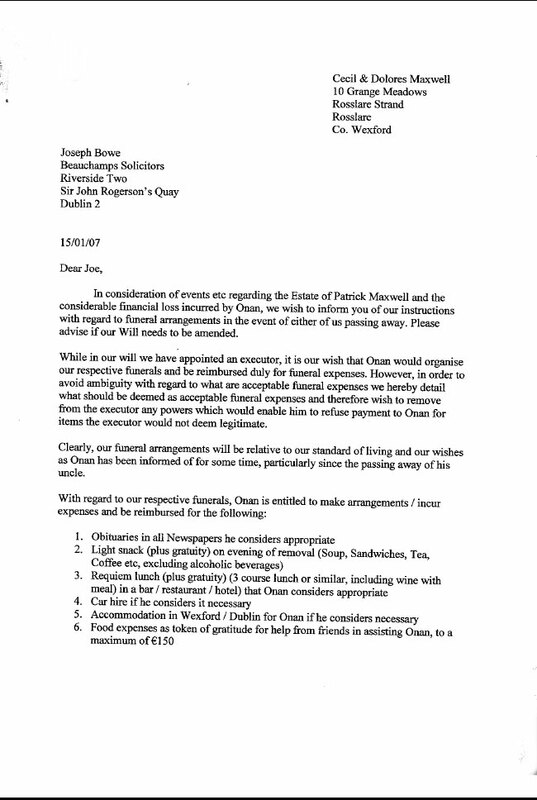 In relation to other matters, I have advised Onan that I may have appointed him as co-executor to my will. Given the current economic climate, I would prefer that he not be at any financial loss arising from his potential co-execution of my will. Therefore, it would be fair and reasonable that as part of his role, he should be paid for car mileage in accordance with Revenue guidelines, for vouched meals and accommadation, telephone calls / credit, which he deems justifiable. I have instructed Onan to organise my funeral etc similar to what he and I organised for Cecil. Acceptable to my estate are claims submitted by Onan in respect of travel (e.g. car, taxi, bus, train) accommodation (including meals), telephone calls / credit. He may also claim for the same expenses as executor. Needless to say, the executors may employ cleaning, gardening services etc to maintain my home in fair condition for sale.